Kimitec Espartan is a product formulated from organic matter obtained from selected vegetables. It stimulates the development of the green organs and fruits of plants. Kimitec Espartan is a product formulated from organic matter obtained from selected vegetables. It stimulates the development of the green organs and fruits of plants. Espartan is rich in organic matter (33.50%) and Fulvic Acids (19.00%) obtained from the concentration of vegetable remains. It also contributes with the essential elements; Nitrogen at 2.70%, Phosphorous at 3.03%, and Potassium at 2.60%. Like all Kimitec Products, Espartan is extremely soluble and will not leave a biofilm buildup in irrigation systems. 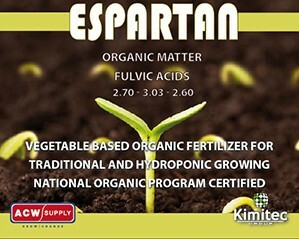 Espartan is one of our best selling Kimitec Fertilizers. With its low application rate (1.5 ml to 20 ml per gallon depending on application type) a bottle goes a long way. This is a great product to introduce you to the power of Kimitec’s fertilizer line.